The OPEC meeting took center stage in the month of June and the decision to increase production by 1 million b/d will definitely have an impact among market players. However, the oil losses coming from Iran, Venezuela and Libya might offset the additional supply provided by OPEC members causing the market to remain tight. Nevertheless, market's biggest concern remains the impact that the escalating trade war between US and China might have on US crude exports, shipping flow towards Asia and global crude prices. Dated Brent prices moved sideways, between $72/b and $75/b, in the first half of June but consistently rose until the end of the month pushed by expectations about the OPEC meeting on June 22. The arbitrage towards the Far East was good around mid-June and helped to sustain BFOE prices, however, many market participants remain particularly concerned about the impact that the escalating trade war between US and China will have on US crude exports and shipping flow towards Asia. China bought about 23% of the total US crude exports in March and retaliatory Chinese tariffs on American crude could redirect those barrels to Europe increasing competition among sweet grades in both the North Sea and the Mediterranean. On the other hand, the OPEC meeting ended with a broad agreement to stop over-complying to production cuts and get back to 100% compliance which, according to OPEC members, should bring back to the market around 1 million b/d of crude which is the amount of oil that Saudis think it's necessary to counterbalance the supply losses in Iran, Venezuela and Libya. Nevertheless, the increase in projected oil demand in the second half of 2018 and the aforementioned supply losses are likely to overshadow the spare-capacity-bounded additional amount of oil that OPEC members can pump out implying that, despite the efforts of producing countries, the global crude oil market is likely to remain particularly tight in months to come. The Volatility Premium, in June, averaged 2.3% which is definitely lower than its 3-month, 6-month and yearly values and it has closed the trading month at negative 7.36% which implies that a market medium-sized adjustment is probably on its way. 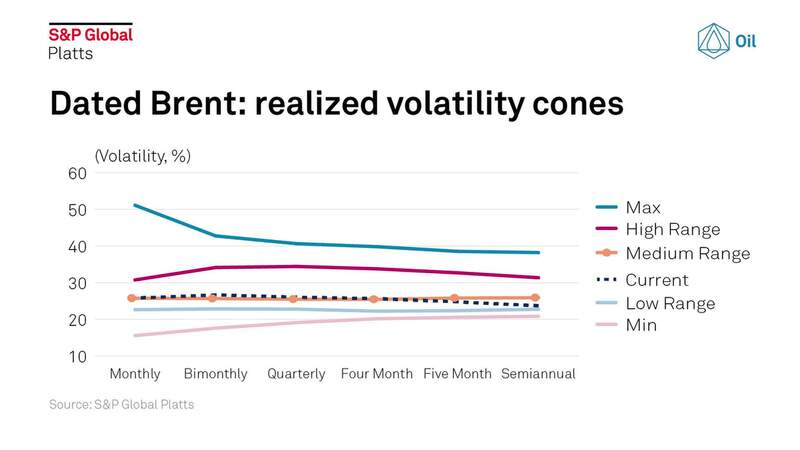 Furthermore, the Probability Distribution analysis shows that Dated Brent's monthly volatility will likely drop in coming weeks and reaches the 20-25% range where it has more than 33% chance to settle favoring a less turbulent trading environment. Finally, the Volatility Cones analysis indicates that the current volatility curve is almost perfectly overlapping the medium range one implying that Dated Brent's fluctuation rate is actually very close to its medium-to-long term equilibrium point. Overall, Brent's volatility should slowly decrease in coming weeks favoring a price uptrend, nevertheless, some short-term price retracements, caused by short-lived spikes in volatility, should be expected.